House of Salem - VOD Review - ReDVDit! House of Salem is a 2016 British horror film written and directed by James Crow. The film stars Jessica Arterton, Liam Kelly, Jack Brett Anderson and Leslie Mills. The films has all the makings of a B level horror film but does a little bit to stand out from the rest of the pack. The story of the film follows Josh(Kelly), a lonely and odd boy, as he is kidnapped from his home and brought to the House of Salem. The kidnappers become his protectors as the story goes on as the job and the house aren’t what they seem. Most of the film feels exactly as one would expect from a low budget horror film. Barely passable effects, awkward acting and plot you’ve seen a few hundred times. That feeling did change as the movie rolls on. The film takes a good bit of time to get rolling, with a majority of the characters just exploring the House of Salem and trying to discover what is so odd about it. While the house is supposed to be freaky and spooky to the viewer, it just feels like it is there. Nothing special about it, just a house the protagonists aren’t allowed to explore. The overall story jumps around a bit. Starts with a kidnapping of a child and one of the kidnappers cares for him and maybe they will escape together. Then cult like things begin appearing and the cults are the problem, until it is all about the Devil. The characters themselves just talk about their pasts and about the clients who hired them to kidnap the boy. At one point while watching I thought the name should be changed to House of the Tragic Backstory, but luckily this gets addressed as the film goes on. There is a twist in the film and while it isn’t a twist that doesn’t make sense, it just doesn’t feel quite right. The film ends like a lot of horror films, on a down note. It might take you a minute to realize why, like it did for me, but it does. The acting for the most part is hit and miss. Leslie Mills, who plays ring leader of the kidnappers Jacob, is really good and has some range in there. Other characters like Jack Brett Anderson’s Jack, the computer hacker even though there isn’t a computer in the film, has one good line but for most of the film came off as awkward. The rest of the cast all come off as passable, but nothing to write home about in the acting department. Other positives about the film is the make up department did a top notch job. The make up used for a lot of the characters looked extremely well done. Especially for a lower budget horror film. Some extra rambling thoughts I had about the film: Josh is about 12-13 and is wearing a onesie pajamas and it is hinted he has some sort of disorder or is kept like a child due to some mental illness, but it is never addressed again. He also has an autistic lamb doll named St. Peter. I hate masks(explained in Audio). The opening visuals are very creepy, which sadly is the creepiest part of the film. The audio needs a mention for this film. A lot of the characters for a good chunk of the movie wear masks. It is very difficult to hear a lot of the characters a lot of the time. The clown masks especially are difficult. One scene, where Jacob(Mills) is threatening Josh(Kelly) and you can barely understand what Jacob is saying because of his clown mask. Josh is also forced to wear a mask and he is a little bit easier to hear, it is still extremely difficult and takes away from any emotion for his scenes. The audio isn’t great at any point with a lot of background noise or echos, but the masks make it so much worse. Sound effects also sound out of place in the film. There is a scene where a door that is being opened creaks and it just sounds so much clearer then the rest of the noise due to it being an effect. 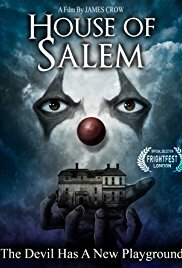 The House Of Salem will be available to purchase from Wild Eye Releasing on VOD beginning on January 23, 2018. In closing, the film is a decent B level horror film. The film won’t blow you away, but if you can get past the audio issues with the masks it is a perfectly acceptable watch.